Grave marker for Frank J. Circelli. 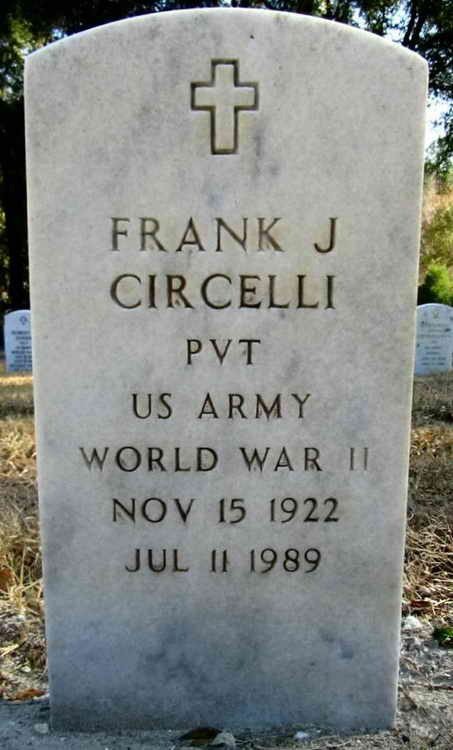 in Plot: 110, 0, 654 of the Florida National Cemetery, Bushnell (Sumter County), FL World War II veteran Frank J. Circelli of Hollywood died Tuesday at Memorial Hospital in Hollywood. He was 66. Mr. Circelli moved to Hollywood in 1959 from Cleveland, where he was born. He served in the 82nd Airborne Division during World War II and was a paratrooper during the invasion of Normandy. He was awarded the Purple Heart and the Bronze Star for his valor in action during the invasion, said his wife of 30 years, Bernice. After the war, he worked as a painting contractor until retiring. Mr. Circelli was a member of the board of directors of the 82nd Airborne Chapter of South Florida. He was also a life member of the Disabled American Veterans Chapter No. 41 and the Veterans of Foreign Wars Post No. 2500, both in Hollywood. He was also a member of Nativity Catholic Church. He is survived by his wife, Bernice of Hollywood; two sons, Frank of Fort Lauderdale and Anthony of Indiantown, Fla.; two daughters, Terri Sobb of Perrysburg, Ohio, and Victoria Ward of Arlington, Texas; two brothers, Joseph and John, both of Solon, Ohio; two sisters, Mafalda Trombetto and Philomena Famageltto, both of Solon; and three grandchildren. Visitation is scheduled for 2-4 p.m. and 7-9 p.m. Thursday. A service is planned by the 82nd Airborne Group at 7:30 p.m Thursday. A mass will be held at 10 a.m. Friday at Nativity Catholic Church in Hollywood. He will be buried at Florida National Cemetery in Bushnell on Monday. Panciera Memorial Home is in charge of arrangements. Frank was a member of Company A and was later transferred to Hq 1st. He was a Pfc in the 10th position of Chalk 6, Lt. Guillot's stick, on D-Day. He was severely wounded on 8 Jun 1944 near Hill 30, Normandy. An urgent radio message from Hill 30 indicated that they desperately needed blood plasma. Captain Adams asked for volunteers to take the plasma to Hill 30. 1st Lieutenant Roy Murray, Corporal Green, and Private First Class Circelli from Hq1 volunteered. They strapped blood plasma pouches to their bodies and during the night left the completely surrounded area. They did not get through to Hill 30. Lieutenant Murray was killed. Corporal Green (unit unknown) was found in a hedgerow a week later completely dazed from the effects of a concussion grenade. Pfc Circelli made it back with several bullets in his arm; he had also been shot in the neck and his lip and chin were shot off.